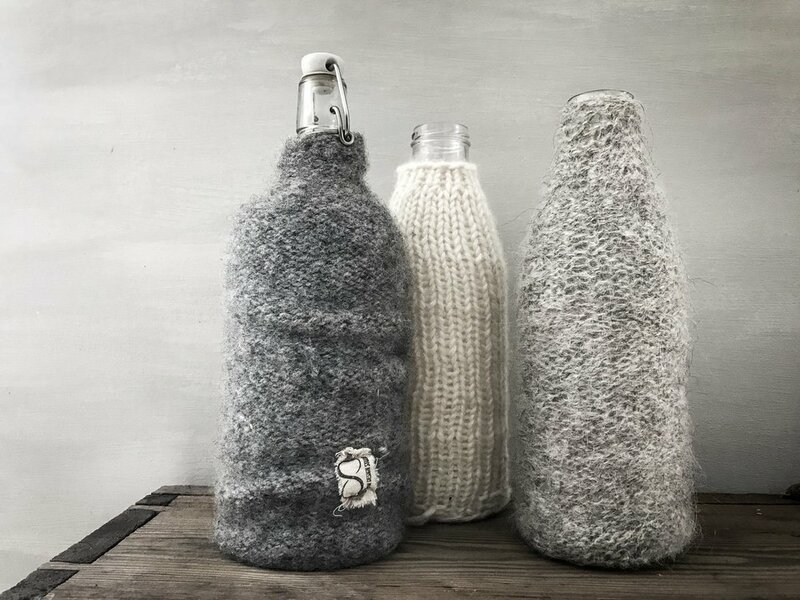 Woolen bottle socks are a great way to keep the temperature on your beverage, whether it's cold milk that is to be kept away from warming sun rays, or hot tea or cocoa that needs a little help to keep warm. This is a simple and quick project, and a great for your left over yarn. The following description is a guidance only, you can vary the size, texture and shape in all kinds of ways that pleases your creativity (and your bottles). It is fun to experiment with different techniques and textures to get the expression you want for your bottle sock. I have felted mine after knitting them, making their insulations ability even better. If you want to do the same, keep in mind that they shrink a good deal in the felting process, so you will have to knit them larger. You must also use a yarn that is chemically untreated (not superwash) in order to make it felt. You have better control of the felting process if you felt it by hand than in a washing machine, but you can stretch the fabric quite a lot as long as it wet, pulling it over the bottle and allow it to "dry into shape." On the three depicted bottles I have used different yarn types and needles sizes. All the yarn types I have used are natural and 100% wool. They are not treated with any kind of chemicals as I would want them One of the bottles is knitted with knitting needle No. 4 and quite thin yarn. I casted on 32 stitches. This bottle warmer is knitted in garter stitch, and as I used circular needles I had to knit and purl every second row, until it measured about 25 cm. The neck is narrowed by knitting two and to stitches together every second row, until I had the right height and width to fit the size of the bottle neck. I chose to felt it lightly and left it to dry on the bottle. On the white bottle I have used thicker yarn and needle No. 8. I casted on only 20 stitches, and knitted circular stitch all the way up to the top of the bottle neck. This bottle sock I did not felt but it still insulates quite well. The third bottle sock is knitted with double yarn. This bottle has a different shape, with a longer and slimmer neck so I had to narrow down the amount of masks quicker on this one. As mentioned above, you will have to adjust your bottle socks to fit the kind of bottles you have, it is easy, and fun a a great project to practice different techniques and textures.